*We miss the overcrowded time around Thanksgiving. *The best of both White Sands and Bosque. *Bosque is probably the best place in the world to practice flight shots, and we'll provide the instruction you need. *We've been photographing this area for almost 30 years, and we'll share everything we know with you. Southern New Mexico has some of the most arid patches of desert in all of North America, and Bosque del Apache National Wildlife Refuge is right in the middle of it. It doesn't sound like the kind of place you'd find some of the best wading bird and waterfowl photography in the world. The Rio Grande River is the magic behind this avian paradise. The river is born in the deep snows of Colorado's San Juan Mountains, and historically spring floods created a series of wetlands that stretched for miles and miles along the river. 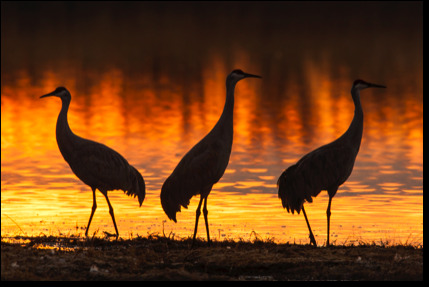 Sandhill cranes have been migrating to this winter oasis since the end of the last ice age, more than 10,000 years ago. Agriculture and burgeoning population centers, like Albuquerque and Santa Fe, put an end to the floods in all but the wettest years, and the cranes were hit hard. The refuge was created in the 1930s expressly to save the cranes, but the year it opened only 17 cranes wintered there. 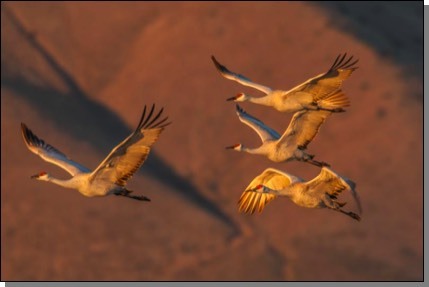 Today, more than 1,000 times that many cranes take advantage of this intensely managed habitat. 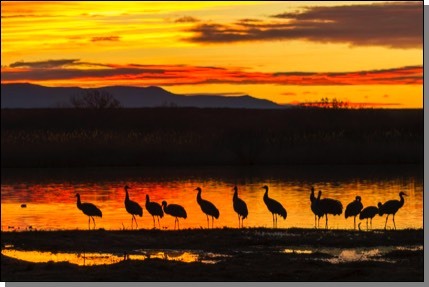 Bosque del Apache is truly one of the Refuge System's greatest success stories. 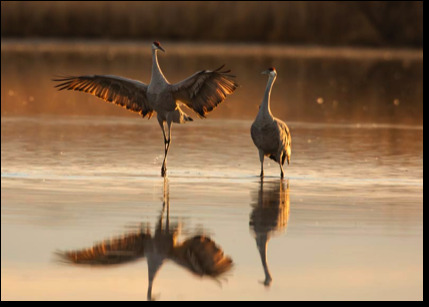 This incredible habitat attracts more than just thousands of sandhill cranes. 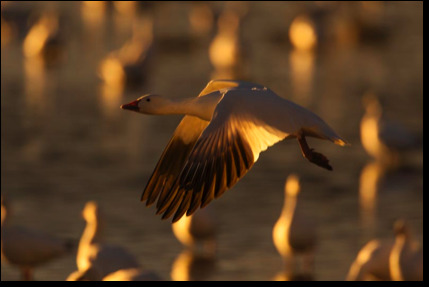 Every winter between 30,000 and 60,000 snow geese descend upon the Rio Grande Valley, turning the desert white with their numbers. Eagles and other raptors follow the waterfowl to the sunny Southwest, roadrunners are often seen even on the coldest mornings, and coyotes grow fat on the abundant birdlife. Photographers have lots of subjects to choose from. There are quite a few places where photographers can use long lenses to capture wading birds and waterfowl, so what makes this place so great? Because of the light and the surrounding scenery, photographers can pretty much use any lens in their bag and come away with some great shots. 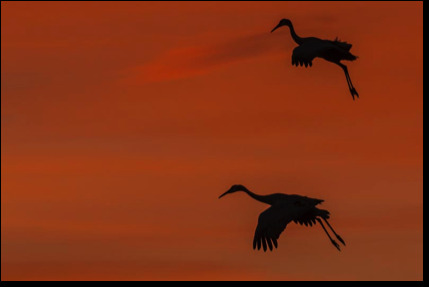 It is the opportunities to use wildlife in scenic images--images with sunrises, sunsets and even moons--that make Bosque the special place it is. This is why photographers keep returning year after year. 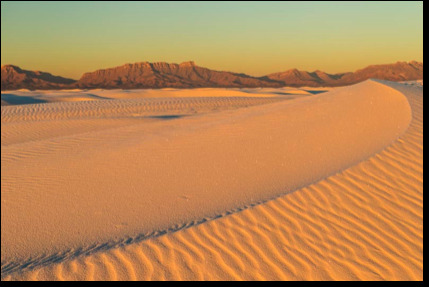 And then there's White Sands National Monument. At the northern end of the Chihuahuan Desert lies one of the world's great natural wonders. At the end of the last Ice Age, a huge salt lake began evaporating here, giving birth to the largest gypsum dune field in the world. Pure white sand dunes cover 275 square miles of the Tularosa Basin, and we'll have 2 full days to work on our compositions in this landscape photographer's paradise. A wilderness of white ripples, undulating dunes and fantastic light are waiting for your creative interpretations. Day 1: We’ll pick you up from Albuquerque airport/airport motel, drive to Alamogordo. Check into our motel, instructional presentation on what we’ll be photographing. Go Photograph! Dinner after we return. Day 2: We will be let into the park before sunrise, in time to photograph pre-dawn, and get into position for sunrise. When we return to town, breakfast time. Photograph again in the afternoon through sunset. Dinner. + One of these nights we will also stay late and try some night photography (weather dependent). Day 3: Into the park early again. Breakfast after morning shoot. Pack up and drive to some nearby petroglyphs. Onward to Socorro, check in and then off to Bosque! Days 4, 5, 6: To Bosque for sunrise and blast-off. Drive the road for other photo opps. Late breakfast. Participant photo critique/sharing and rest/recharge time. Back to the refuge for sunset. Dinner after. Day 5: One last chance for sunrise, blast-off. Pack, breakfast and back to Albuquerque.